With the recent influx of appealing compact cars, it's natural to question the relevance of the full-size 2014 Chrysler 300 sedan. But then you drive one, and you realize the 300 is a rolling refresher course in everything that makes American cars great. Large and in charge, with a robust roster of V6 and V8 engines to choose from, the 300 commands the road like a classic highway cruiser. At the same time, the luxurious, high-tech cabin makes the 300 an attractive alternative to a wide range of premium sedans. Another Chrysler 300 calling card is its slinky styling, which is great for turning heads -- unless it's your own head when you're trying to see what's behind you. Thanks to the high beltline and small windows, rear visibility is less than ideal. Fortunately, a rearview camera comes standard on all but the base model, ensuring that maneuvers in reverse, at least, won't require too much guesswork. As for visibility at speed, the 300's powerful engines tend to keep your focus on the road ahead, provided the car at six o'clock doesn't have flashing lights on top. The large sedan segment is in the midst of a renaissance, highlighted by recently redesigned or updated versions of the Buick LaCrosse, Chevrolet Impala, Hyundai Azera and Toyota Avalon, as well as the Azera's corporate cousin, the all-new Kia Cadenza. These sedans offer more usable legroom for three rear passengers, because of their front-wheel-drive architecture and subsequent lack of a transmission tunnel hump in the middle of the floor. Fuel economy on these cars also tends to be a bit better, especially with the hybrid versions of the Impala, LaCrosse and Avalon. But as compelling as those rivals are, they don't offer all-wheel drive or V8 power, nor can they match the Chrysler's sheer presence at the curb. Chrysler's full-size cruiser is more than just relevant for 2014; it's one of the best cars you'll find for the money. 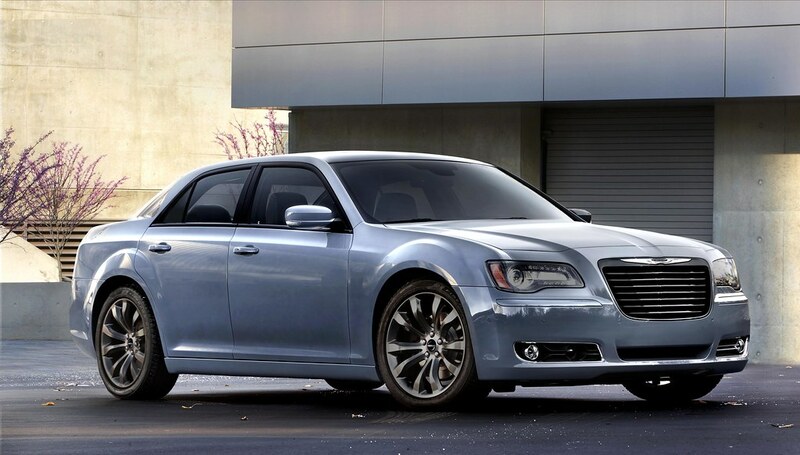 The 2014 Chrysler 300 is a full-size sedan available in six primary trim levels: 300, 300S, 300C, 300C John Varvatos Luxury Edition, SRT8 Core and SRT8. Even the base 300 comes loaded with luxuries, including 17-inch alloy wheels (19-inchers with all-wheel drive), automatic headlights, heated mirrors, keyless entry and ignition, an auto-dimming rearview mirror, cruise control, an 8.4-inch central touchscreen interface, dual-zone automatic climate control, leather upholstery, heated front seats, an eight-way power driver seat (with four-way power lumbar adjustment), a tilt-and-telescoping steering wheel, Bluetooth phone and audio connectivity and a six-speaker sound system with a CD player, an auxiliary audio jack, iPod/USB connectivity and satellite radio. The 300S is something of an island in the 300 lineup, adding 8 horsepower under the hood (V6 only), 20-inch alloy wheels with performance tires (19-inchers with AWD), a "touring" sport suspension, a Sport mode and shift paddles for the transmission, remote start, unique black-out styling elements, foglights, an eight-way power passenger seat (with four-way power lumbar adjustment), piano-black cabin accents, a rearview camera and a 10-speaker Beats by Dr. Dre sound system. Stepping up to the 300C adds the following to the base 300's equipment list: 18-inch alloy wheels (19s with AWD), remote start, foglights, additional chrome exterior accents, a driver-side auto-dimming mirror, LED cabin lighting, heated and cooled front cupholders, power-adjustable pedals, a power tilt-and-telescoping heated steering wheel, leather upholstery, heated and ventilated front seats, driver memory functions, heated rear seats, a power rear sunshade, a rearview camera, a navigation system with Garmin-sourced software and a six-speaker Alpine audio system. The 300C John Varvatos Luxury Edition (named after the menswear fashion designer) tacks on niceties like "platinum chrome" exterior trim, 20-inch wheels (19s with AWD), the touring suspension and Sport shift features from the 300S, upgraded leather upholstery, extended leather trim and hand-sanded wood inserts. Note that the John Varvatos Limited Edition will again be offered late in the 2014 model year, adding flourishes such as "titanium chrome" exterior trim, Varvatos logos on the seats and an exclusive gauge cluster and clock featuring the Varvatos name. The SRT8 Core shifts gears to high-performance mode, featuring a 6.4-liter V8 engine, special 20-inch wheels, Brembo brakes, black exterior accents, a performance-oriented three-mode stability control system, launch control, sport-tuned steering and cloth-upholstered sport seats. The Core's other standard features are relatively basic, however, mirroring the entry-level 300 for the most part. The full-flavored SRT8 comes with different 20-inch wheels and adds a three-mode adjustable sport suspension, front and rear parking sensors, adaptive and auto-leveling bi-xenon headlamps, sport seats with leather/faux-suede upholstery and most of the luxury features from the 300C. Many of the upper trims' features are available on the lower trims as stand-alone options or via various packages. Other option highlights include a panoramic sunroof and a 19-speaker Harman Kardon sound system. All 2014 Chrysler 300 trims except the SRT8 come standard with a 3.6-liter V6 that produces 292 horsepower and 260 pound-feet of torque. The 300S V6 gets minor tweaks (including a sport-tuned exhaust) that bump output to 300 hp. An eight-speed automatic is standard, as is rear-wheel drive. All-wheel drive is optional. In Edmunds performance testing, a rear-drive 300S went from zero to 60 mph in 6.9 seconds, which is about average for a V6-powered full-size sedan. An all-wheel-drive 300C with the V6 took just 0.2 second longer in spite of its added weight. EPA-estimated fuel economy for the V6 is a respectable 19 mpg city/31 mpg highway and 23 combined. All-wheel drive, which is available on all V6-powered models, drops those numbers to 18/27/21. Optional on all but the base 300 and SRT8 is a 5.7-liter V8 good for 363 hp and 394 lb-ft of torque. A five-speed automatic and rear-wheel drive are standard, while all-wheel drive is optional. EPA-estimated fuel economy is 16/25/19 with rear-wheel drive and 15/23/18 with AWD. The SRT8 boasts a 6.4-liter V8 good for 470 hp and 470 lb-ft of torque. Rear-wheel drive and a five-speed automatic with paddle shifters are mandatory. In Edmunds performance testing, the SRT8 went from zero to 60 mph in a very quick 4.7 seconds. Fuel economy for the SRT8 is 14/23/17. Every 2014 Chrysler 300 comes with antilock brakes, traction and stability control, front side airbags, side curtain airbags, a driver knee airbag and active front head restraints. A rearview camera is standard on all but the base 300. The SafetyTec package adds a blind-spot warning system, a rear cross-traffic warning system and a forward collision warning system. In Edmunds brake testing, the base 300 came to a stop from 60 mph in a better-than-average 118 feet. The 300S was essentially the same; however, a heavier 300C AWD took 133 feet: a subpar braking distance for this class. Meanwhile, an SRT8 stopped in an excellent 111 feet, though its high-performance summer tires certainly provided additional grip, enabling it to excel in this test. In government crash testing, the 300 came up aces, earning a top five-star overall rating with five stars for total frontal impact safety and five stars for total side-impact safety. Likewise, the Insurance Institute for Highway Safety gave the 300 its top rating of "Good" in moderate-overlap frontal-offset, side-impact and roof-strength crash tests. The Chrysler 300's cabin isn't exactly avant-garde, but there's no question that it's a classy place to be. Every 300 employs rich finishes and extensive soft-touch materials, while the 300S adds some visual flair with its available two-tone color schemes. The John Varvatos Luxury Edition ups the ante with special wood and extended premium leather trim. On the technology front, the standard 8.4-inch touchscreen interface is one of our favorites, pairing large buttons and crisp graphics with a logical menu structure. We also appreciate the 300's diverse array of audio options, including an Alpine system, a Harman Kardon system, and of course the thumping Beats by Dr. Dre setup. Given the Chrysler's ample proportions, it should come as no surprise that there's plenty of room for occupants of all sizes. The adjustability of the driver seat and tilt-and-telescoping steering wheel is particularly generous, while the rear seats are both spacious and supportive. Compared with other large sedans, though, the middle rear seat isn't as comfortable or useful due to the 300's transmission tunnel hump. Luggage capacity is average for a large sedan, checking in at 16.3 cubic feet, but the wheelwells may limit loading depth for larger items. The 2014 Chrysler 300 glides down the road with the smooth, substantial feel of a big Mercedes-Benz sedan. That's not entirely coincidental, as some aspects of the 300's suspension can be traced to Mercedes blueprints from the DaimlerChrysler days. The 300 remains unruffled even on heavily rutted pavement. The ride becomes firmer with the touring suspension or any of the numerous 19- and 20-inch wheel designs, though, so depending on your local driving conditions, you may want to go with smaller wheels and tires. Under the hood, the 300 is famous for its big V8s, but the standard V6 is a strong performer in its own right. It's also pretty fuel-efficient with rear-wheel drive, and the eight-speed automatic is smooth and responsive. Of course, the optional 5.7-liter V8 is worth the stretch for those who appreciate good old American muscle, though it comes with an outdated five-speed automatic that's not as refined or quick-witted as we'd like. The 2014 Chrysler 300 SRT8 is saddled with the same dated five-speed automatic, but its 6.4-liter V8 delivers absurd acceleration and an epic soundtrack to boot. In corners, the Chrysler 300's bulk is inescapable, but its rear-wheel-drive platform, disciplined dampers and nicely weighted steering nonetheless inspire confidence. That's especially true of the sportier 300S. You won't notice a dynamic difference between the rear- and all-wheel-drive models, so the choice there comes down to whether you want AWD for winter driving. Meanwhile, the ultra-sporty SRT8 model defies at least two laws of physics, as it grips and handles like a car half its size. Aside from the 300's compromised rear visibility -- an inevitable consequence of the car's high beltline, small windows and thick rear pillars -- it's hard to find fault with how it drives.